with William J. Hochul, Jr.
SS. Columba-Brigid Church, 75 Hickory St., Buffalo hosted the event April 15, at 3:00pm. A reception followed. A U.S. Attorney for the Western District of New York 2010 – 2016, Mr. Hochul talked about the ideals that led him to his long career in the legal field. He shared highlights of his extensive experience with why people resort to violence, what can help them turn from violence and what a community can do to assist people to live nonviolent lives. A Cheektowaga native, Mr. Hochul received his undergraduate degree from the University of Notre Dame in 1981 and his J.D. from SUNY Buffalo Law School in 1984. He currently serves as general counsel for Delaware North. The event also honored William Marx and the Buffalo Peacemakers Gang Intervention and Outreach Program. Mr. Marx, a member of the Center’s board, is a long-time advocate of social justice, particularly through Pax Christi and as a facilitator of the Alternatives to Violence Project. Celebrating its fifth anniversary, the Peacemakers brings together existing peace-making groups to mentor youth, strengthen communities, enhance safety and reduce crime in Buffalo neighborhoods. April 2, 2017 "On the Edge of Violence and Nonviolence: The Challenging Words of Judaism, Christianity, and Islam"
Dr. Christopher Stanley, professor of theology at St. Bonaventure University, will speak at the SSJ Sister Karen Klimczak Center for Nonviolence’s annual fundraiser on April 2nd. SS. Columba & Brigid Parish (75 Hickory St.) will host the event at 3:00pm. Dr. Stanley’s presentation, “On the Edge of Violence and Nonviolence,” will examine some key texts in all three Abrahamic religions—Judaism, Christianity and Islam—that give divine sanction to both violence and nonviolence. Followers of the religions have long struggled to make sense of these directives and to understand how they can be applied today. Some benefits and dangers of guiding our lives by these texts will be discussed. A lifelong activist and pacifist, Dr. Stanley has traveled the world to help people explore the role of religion in contemporary social conflicts. He will call us to respond nonviolently to the challenges facing our society today. A celebration of the 10th anniversary of the SSJ Sister Karen Klimczak Center for Nonviolence and a reception will follow the presentation. Tickets are $25 and are available by calling 362.9688, online at www.sisterkarencenter.org, or at the door. A warm and sunny day at Canalside on September 11th was the setting for the third annual Peace-Justice-Nonviolence Festival and Walk. The Sister Karen Center was one of over 125 sponsoring organizations which comprise the WNY Coalition ofPeace, Justice and Nonviolence Advocates. The lively festival was just one of the multitude of ways these groups are hard at work to reduce violence in our community and world. The festival was intentionally planned on September 11th to reframe and rededicate the day in accordance with the vision of the September 11th Families for Peaceful Tomorrows. The nonviolent examples of Martin Luther King Jr. and Sister Karen Klimczak, Buffalo’s Apostle of Peace, were an inspiration for the festival. Members of the Haudenosaunee Confederacy opened the proceedings with a traditional Indigenous Nation’s Welcome and Thanksgiving to All Creation. The greeting was followed by an interfaith prayer and moment of silence for all victims of violence locally and throughout the world. Various speakers emphasized the interconnectedness of the violenceof racism, Islamophobia, misogyny, poverty, war, gun violence and the destruction ofMother Earth. Participants were given a ribbon of fabric and asked to write on it a word or phrase that expresses peace, justice, and nonviolence. The ribbons were tied together and carried on a Walk of Peace with drumming and singing along the river to the marina gardens. Throughout the festival over 400 attendees mingled at informational tables staffed by community organizations. (Sister Jean Klimczak gave out “I Leave Peaceprints” dove signs at the Sister Karen table!) Vendors offered tasty ethnic food. Facepainting by Charlotte Waltz-Rieber and craft-making were enjoyed by children of all ages. 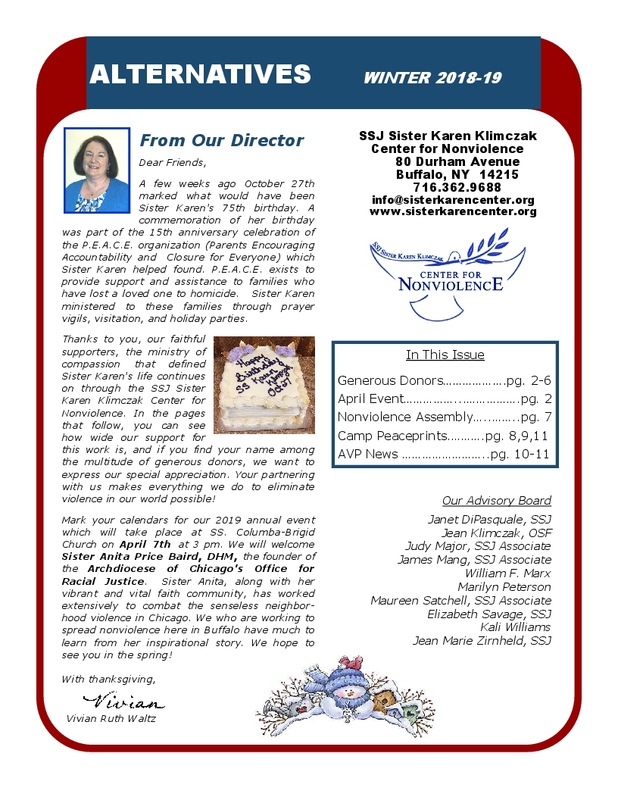 Click the image above to view/ download our newsletter. 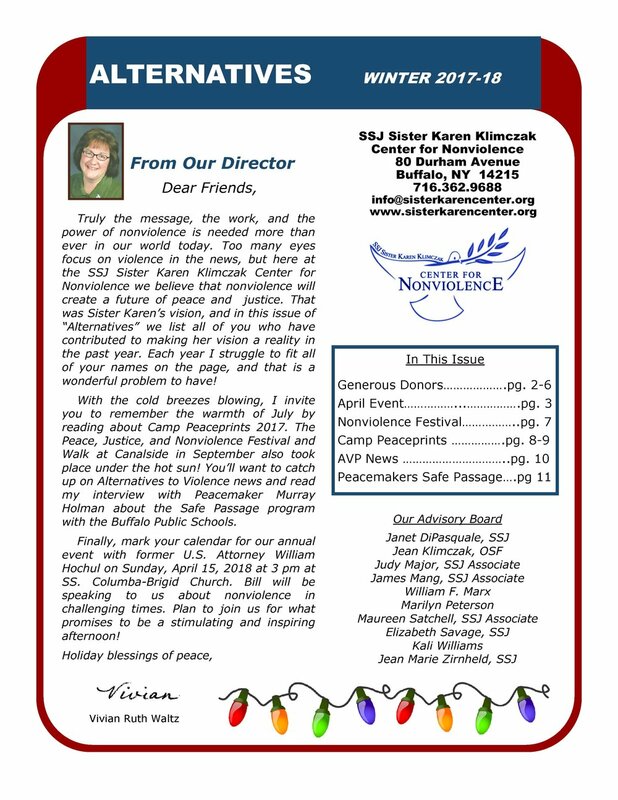 To carry on Sister Karen's vision of a world without violence, the SSJ Sister Karen Klimczak Center for Nonviolence is committed to eliminating violence in ourselves, in our society and in our world. We work to create a nonviolent community in our thinking, our acting and our relationships. Promote Education: Offer opportunities for people to learn and practice nonviolence. Provide Training: Offer age-appropriate training in nonviolence for youth and adults utilizing the Alternatives to Violence Project (AVP) as a central program. Supply Resources: Gather the best resources available on nonviolence. Build Relationships: Work in coalition with community groups which promote nonviolence. Please help us to keep Sister Karen's vision of a world without violence alive! Thanks for joining our eMail list and look for events and info from us!